Owls Head Lighthouse was built in 1825 and stands 26 feet tall. Its guiding light shines out over Penobscot Bay from a vantage point 100 feet above sea level, which offers visitors a commanding view of the surrounding seascapes and islands. Description: White, conical brick tower. Location: On the point of Owls Head. Status: Active aid to navigation owned by the U.S. Coast Guard and licensed to the American Lighthouse Foundation. 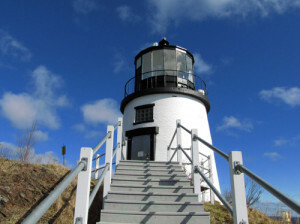 Lighthouse was restored in 2010 and is now preserved under a maintenance schedule. In 2013, the American Lighthouse Foundation moved its headquarters to Owls Head Light Station. Volunteers from ALF’s Friends of Rockland Harbor Lights staff the lighthouse and work with the home office staff to care for the lighthouse.